Last Friday December 2th, Denmark has announced officially that it will suspend its participation in airstrikes on Syria and Iraq. This note of Altinget entitled “Danmark trækker kampfly ud af Irak og Syrien” gives some precisions. In this press note of The Local, we read that Danish Foreign Ministry Anders Samuelsen stated that “We have decided to withdraw the Danish fighter jets as planned“. The official statement in Danish indicates that: “Medio december returnerer de danske kampfly og det danske transportfly som planlagt til Danmark. Efter hjemtagelsen af de to flyvende bidrag vil Danmark fortsat levere en markant militær indsats til støtte for kampen mod ISIL” (see full text of the official statement in Danish reproduced at the very end of this note). It must be noted that no reference is made in this official statement of last December 2th to past missions to which Danish aircrafts participated. A simple coincidence or a decision taken after the publication of investigations ? A few days before, press releases dated November 30 informed that top officials from United States recognised after military investigations some errors during a mission held on September 17th: an internal memorandum dated November 29 with a report with the mention “approved for release” of CENTCOM (US Central Command) dated November 2nd is available here. As predictable with CENTCOM reports and internal memoranda on military operations, no all the text can be read. In a note of The Local (Denmark) related to this report, it is written that the reaction of Danish authorities were the following: “Defence Command Denmark, the command centre for the Danish armed forces, released a short statement following the attack that confirmed that Danish fighter jets were part of the mission. The Danish forces said it was “of course unfortunate if the coalition mistakenly struck anything other than ISIL forces“. “British, Danish and Australian warplanes took part in the U.S.-led coalition’s airstrike Saturday that reportedly killed more than 60 Syrian government troops and threatened to unravel the “cessation of hostilities,” military officials said Monday. The Syrian army and a key rebel leader declared that the cease-fire had collapsed and blamed each other for violations, but U.S. Secretary of State John Kerry said he was working for a possible extension of the seven-day-old cessation period that ended Monday“. On the same day of November 30, a note published in Australiaentitled “Syria campaign: Lessons from botched air strikes revealed in US review“stated that: “The United States-led review into the air strike released early Wednesday morning highlights two key points about the international coalition air war over Syria: first, that even the best planned military campaign will make mistakes and kill innocents, and second, that the Coalition air campaign has been one of the most tightly controlled in the history of air power. The remarkable thing is that more people haven’t been wrongly killed by Coalition strikes. This constraint on air operations is legally and morally right, but the effect has been to render much of the Syrian air campaign useless. The review makes it clear that a number of factors contributed to inadvertently targeting a position near Dayr az Zawr, on 18 September occupied by Syrian Army or militia forces. For some reason intelligence reporting incorrectly identified the position as occupied by so-called Islamic State fighters“. “The review finds that some overlooked intelligence reporting cast doubt on whether the position was IS controlled. There seems also to be been confusion over map coordinates between digital and paper maps. After the air strikes began a Russian officer called the coalition’s Combined Air Operations Centre but the requested contact was not present to receive the call. A second Russian call was made, some 27 minutes later, presumably after the strikes had destroyed their target. If that sounds messy, it is“. “En ce qui concerne les frappes de la France en Syrie, les premières bombes françaises ont été lancées par ses avions il y a exactement deux mois, le dimanche 27 septembre 2015. Peu d’informations ont été apportées par les autorités françaises concernant le choix et l’opportunité de cette date pour procéder à ces premiers bombardements en Syrie. Coïncidence (heureuse ou malheureuse), dans son allocution prononcée devant l’Assemblée générale des Nations unies 24 heures plus tard, le chef de l’État a simplement mentionné que « La France /…/entend prendre ses responsabilités. Elle les a prises, encore récemment, y compris par une action armée, une action de force» (see our article published in Voltairenet of December 1st, 2015). Almost one year after, in his last speech at the UN General Assembly, French President reiterated his strong opposition to current authorities of Syria (see note of Le Monde of September 22, 2016). Coming back to the Danish decision itself, it is the first time that a European country decides to suspend its engagement in this kind of military operations. However, it is no the first time that airstrikes in Syria and Iraq are suspended by a State: last February 22, 2016 Canada officially suspended all operations consisting in bombing targets in Iraq and Syria, ending a controversial action inherited from Prime Minister Harper administration (see press note). As well known, Aleppo (حلب or “Halab” in Arabic) is the largest city in Syria and the country’s industrial and financial center. It is also “one of world’s oldest continually inhabited cities, mentioned in Egyptian texts from the 20th Century BC” as indicated in this BBC note of November 2016. Since 2012, Aleppo is a battleground. “The UN Security Council failed to adopt a draft resolution aimed at establishing a ceasefire and restoring immediate and unrestricted access to humanitarian assistance due to a new veto by Russia. In the face of an exceptionally serious humanitarian situation in Syria, marked by the tragic situation in Aleppo, France supported this text without any hesitation. I deplore the fact that, as a result of Russian obstruction, the UN Security Council is still not able to assume its responsibilities with respect to the civilian populations in Syria who are facing the destructive folly of Bashar al-Assad’s regime, as well as the terrorist groups, starting with Daesh. France has believed since the start of the Syrian crisis that the only way to put Syria back on the path toward peace and stability is through a political solution. On the contrary, military escalation results in deadlock which only serves to exacerbate the suffering of the people and fuel terrorism” (see official statement). It must be noted that the Syrian delegate indicated to his colleagues in New York that: “… the United States, France and the United Kingdom were the “three musketeers” defending terrorism, with the support of Turkey, Qatar and Saudi Arabia, demanding to know where the “three musketeers” had been when so-called moderate armed groups had bombed a Russian Federation field hospital in western Aleppo. Those three Governments should have welcomed Syria’s fight against terrorism now that the threat was present in every corner of the world” (see UN press release). 24 hours after the vote that took place in New York, BBC entitled its note “Aleppo battle: Syria rebels ‘withdraw from old city’” (see BBC note) while The Guardian´s note was edited with the following tittle: “Syrian troops in control of Aleppo’s Old City after rebels withdraw” (see note). In this note of Telegraph dated December 6th, we read that “the appeal looks likely to be ignored by the Syrian leader Bashar al-Assad and his Russian and Iranian allies as they continue to make rapid progress in what may be the final days of the four-year battle for Aleppo“. Who are really members of the “coalition against ISIS” ? It must be recalled that in a report of the Foreign Affairs Committee of the House of Commons entitled “The extension of offensive British military operations to Syria“, information was provided in order to know which were the States involved in airstrikes in Syria (and in Iraq). At note 22, page 9, we read the following data, that refers to Denmark withdrawn: “Airstrikes in Iraq: US, UK, Australia, Belgium (withdrawn), Canada (expected to withdraw), Denmark (withdrawn), France, Jordan, The Netherlands (9). Airstrikes in Syria: US, Australia, Bahrain, Canada (expected to withdraw), France, Jordan, Saudi Arabia, Turkey, UAE (9). Total of 13 states overall”. Concerning the participation of others members of the so called “coalition against ISIS“, on Nov. 30, 2015 The Washington Times informed (see note) that some members of the coalition have stopped flights against ISIS positions: “One Pentagon official directly involved in the counter-Islamic State fight told The Washington Times that the Saudis haven’t flown a mission against the group in nearly three months. The official, who spoke on condition of anonymity, said that Bahrain is still involved, but confirmed that Jordan stopped flying sorties against the extremists in August and the UAE hasn’t flown one since March”. Curiously, in its presentation at the “Sénat” in France, on November 25, 2015 French Minister of Foreign Affairs declares publicly that: “Si la France est aux avant-postes du combat, elle ne le mène pas seule. Le combat contre le terrorisme est aussi celui des Nations unies. La France a obtenu le vote de la résolution 2249 à l’ONU, qui appelle à amplifier la lutte contre Daech. Une trentaine d’État sont engagés militairement dans la coalition“. The number 13 is a number of member States quite far from 30. But visually speaking (mainly if you are an urged person acting as a French Minister of Foreign Affairs asking to your Senate a special authorisation) the number 13 is quite close to 31. In this other report on The Netherlands transparency on airstrikes, it can be read that Dutch extreme discretion has suffered indiscretions twice: “On only two occasions have the locations and dates of Dutch airstrikes in Iraq been revealed – on neither occasion by the Netherlands itself. Following a strike on Fallujah on July 25th 2015, France later reported it had carried out the mission with Dutch assistance: “Cette mission fut réalisée conjointement avec des avions américains et hollandais.”5 And in September 2015, Airwars in collaboration with RTL Netherlands was able to show that according to a declassified CENTCOM document, Dutch aircraft had been implicated in a possible civilian casualty incident ten months earlier“. Recommendation: That Denmark adopts Canada’s best-practice, reporting regularly on where, when, and with what assets it carries out airstrikes in Iraq. Recently, Amnesty International issued a report calling US and its allies to be more precise concerning civilian deaths caused by coalition airstrikes in Syria (see AI report dated October 26, 2016). The text states that: “It’s high time the US authorities came clean about the full extent of the civilian damage caused by Coalition attacks in Syria. Independent and impartial investigations must be carried out into any potential violations of international humanitarian law and the findings should be made public“. Lack of transparency of States involved in airstrikes in Syria and Iraq is questionable, and local lawyers, professional associations, journalists and NGO should try to obtain more information from their reluctant States and military authorities. Precise information on airstrikes, chain of command and many other details can allow some of the victims to try to seek justice and to obtain compensation after long years before national courts of the States involved in what are officially called “civilian casualties”. Recently we read in a note of Independent that ““Although the Coalition makes extraordinary efforts to strike military targets in a manner that minimises the risk of civilian casualties, in some cases casualties are unavoidable. “We regret the unintentional loss of civilian lives resulting from Coalition efforts to defeat Isil [Isis] in Iraq and Syria and express our deepest sympathies to the families and others affected by these strikes“. “The death of their relatives was the result of a fatal airstrike ordered by Colonel Klein who was in charge of the Provincial Reconstruction Team in Kunduz in the northern part of Afghanistan. The PRT was institutionally embedded in the framework of the International Security Assistance Force (ISAF). Whilst Klein was operationally subordinated to the ISAF commander and in the end the NATO Commander-in-Chief he remained within the chain of command of the German Federal Army ultimately being subject to orders of the German Ministry of Defense“. “In light of the effective control exercised by Germany in Kunduz, the ECHR is applicable to the case at hand and Klein’s order remains attributable to Germany as the sending state due to his effective control of the events in question irrespective of the overall institutional embedding of the deployment of the German army (ISAF/NATO). As Art. 15 of the ECHR purports guarantees of the Convention do not lose their obliging force in the context of armed conflicts, even though a need for systemic integration with the rules of the ius in bello might arise (see only ECtHR, Case of Hassan v. UK, Application no. 29750/09). The Court – which was constitutionally obliged to take a closer look at the normative commands of the Convention – however remained ignorant of a long series of judgments in which the ECtHR asserted by reference to Art. 13 ECHR that states are obliged to install a compensatory mechanism in cases of “arguable claims” with regard to violations of Art. 2, 3 ECHR“. It must be noted that, generally speaking, information provided officially by members of the so called “coalition” is not necessarily very clear, and numbers differ from one official source to another one, but data base and reports elaborated by Airwars.org allow to have a better idea of the logic behind airstrikes campaign launched by the so called “coalition against ISIS“. 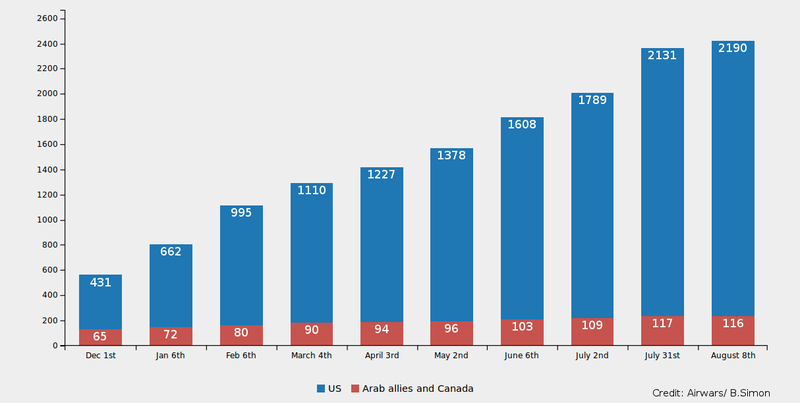 An updated chart shows that at the date of November 27, 2016, 5673airstrikes in Syria were launched by US, and 306 by Canada, Australia, France, UK, Saudi Arabia, UAE, Jordan, Bahrein and Turkey (see Chart “Cumulative US and allied airstrikes in Syria” available here). These numbers, poorly reported in media and press release, show that the “allies” launched 5,4% of the airstrikes in Syria, and United States, 94,6% of airstikes in Syria. One year ago, British Prime Minister appealed to Parliament Members to vote in favor of Royal Air Forces (RAF) airstrikes against Islamic State (ISIS) in Syria, in order to “keep the British people safe” from the threat of terrorism. At the opening of a 10-hour Commons debate on December 2, 2015, he said the country had no other choice. In the report presented to the Parliament he stated that: “I believe that the UK should now join Coalition airstrikes against ISIL in Syria” and pointed out that “On 20 November 2015, the UN Security Council unanimously called on Member States to use all necessary measures to prevent and suppress terrorist acts committed specifically by ISIL, and to deny them safe haven in Syria and Iraq”. A few hours after the vote, early on December 3, 2015, first UK ´s airstrikes took place in Syria (see note of France24). However, this text has been presented as a solid legal basis for airstrikes in Syria by France and United Kingdom. “Resolution 2249, on the other hand, is constructed in such a way that it can be used to provide political support for military action, without actually endorsing any particular legal theory on which such action can be based or providing legal authority from the Council itself. The creative ambiguity in this resolution lies not only in the fact that it does not legally endorse military action, while appearing to give Council support to action being taken, but also that it allows for continuing disagreement as to the legality of those actions”. “Calling this particular resolution “clear and unambiguous” is, with respect, a real howler. But nonetheless we can see how the ambiguity of the resolution also did its magic in internal UK politics, and not just on the international plane – I very much doubt that without it the Prime Minister could have obtained the necessary majority for the air strikes, or even if he did that majority would have been slim indeed”. Legal arguments to justify military operations in Syria in 2015 recall discussions that took place a few weeks after 9/11. In an article of November 2015, entitled “Interventions en Syrie : entre légitime défense individuelle, collective et contournement des autorités syriennes” , wer read that “Olivier Corten, Professeur de droit international à l’Université Libre de Belgique, estime qu’elle est la manifestation d’une nouvelle doctrine française d’unilatéralisme qui renvoie aux guerres préventives de l’administration américaine de l’ancien Président Georges W. Bush. Elle s’inscrirait dans la « culture de l’intervention » développée au cours de la décennie de la « guerre contre le terrorisme » des années 2 000, en rupture avec le texte et l’esprit de la Charte des Nations Unies“. « Thus, numerous military interventions have been conducted in the name of self-defence, including against Al Qaeda, ISIS or affiliated groups. While some have downplayed these precedents on account of their exceptional nature, there is a serious risk of self-defence becoming an alibi, used systematically to justify the unilateral launching of military operations around the world. Without opposing the use of force against terrorist groups as a matter of principle — particularly in the current context of the fight against ISIS — we, international law professors and scholars, consider this invocation of self-defence to be problematic. In fact, international law provides for a range of measures to fight terrorism. Priority should be given to these measures before invoking self-defence ». “Finally, self-defence should not be invoked before considering and exploring other available options in the fight against terrorism. The international legal order may not be reduced to an interventionist logic similar to that prevailing before the adoption of the United Nations Charter. The purpose of the Charter was to substitute a multilateral system grounded in cooperation and the enhanced role of law and institutions for unilateral military action. It would be tragic if, acting on emotion in the face of terrorism (understandable as this emotion may be), that purpose were lost“. On this global call, we refer to our modest article entitled “Against the abusive invocation of self-defence against terrorism” and to the updated list of signatures collected, available here. Regeringen har i dag på et møde i Udenrigspolitisk Nævn rådført sig med Folketinget om en udvidelse af den danske træningsindsats i Irak med et ingeniør- og konstruktionshold. Medio december returnerer de danske kampfly og det danske transportfly som planlagt til Danmark. Efter hjemtagelsen af de to flyvende bidrag vil Danmark fortsat levere en markant militær indsats til støtte for kampen mod ISIL. Der er i løbet af det seneste år gjort betydelige fremskridt i kamp mod ISIL, men det er nødvendigt, at koalitionen også i den kommende periode fastholder et markant militært pres på terrororganisation i Irak og Syrien. I takt med udviklingen vil koalitionen løbende tilpasse sin indsats, så den bedst muligt understøtter det overordnede mål med den militære kampagne: At besejre ISIL. Udvidelsen med et ingeniør- og konstruktionshold skal tjene til, at det danske bidrag får styrket evnen til at uddanne og træne de irakiske sikkerhedsstyrker inden for eksempelvis håndtering af improviserede sprængladninger og feltmæssig ingeniørtjeneste. Fra januar 2017 vil Danmarks militære bidrag til indsatsen mod ISIL således bestå af et radarbidrag på op til ca. 30 personer, et kapacitetsopbygningsbidrag i Irak på op til ca. 150 soldater, et styrkebidrag omfattende specialoperationsstyrker på op til ca. 60 personer samt op til ca. 20 stabsofficerer tilknyttet koalitionens hovedkvarterer.